The Waldorf Concept started after WWI in 1919 by Rudolph Steiner who wanted to help the children after the war who were so scarred by the war that they could not relate to normal life. To counter act the perils of war he came up with the theories and schooling to teach them to get back to basics and engage in hand making things and dolls were one of those things that helped them connect with nature. Nancy Mclaughlin, the founder of the DragonFly’s Hollow company also known as DFH was making these dolls and toys for her kids when the oldest was just a toddler. 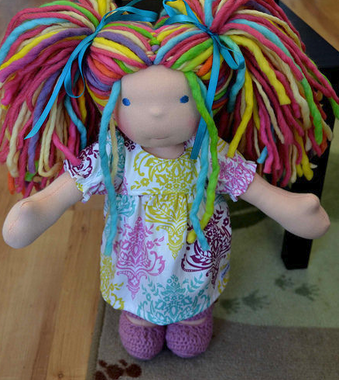 One of her friends told her about etsy.com and in September of 2008 she listed a doll and went to bed. Nancy awoke the next morning to find an email of a sale and another email from a sweet lady in Australia talking about how she bought the very first Waldorf Doll from Dragonfly’s Hollow. From then on Nancy would make an item and sell it, reinvest the money, make a few more things and sell them. Several years later and after 2 household moves, DFH opened a shop in Denton Texas. In February of 2014 Nancy hired an assistant to help with the running of the shop and the production of the items. In April of 2014 DFH opened up the selling of the Dolls and Toys for Made to Order purchases to Consultants, which is why I am here today with all of you. We are totally dedicated to having our entire work force right here in the US. We strive to source as much of our materials from small US suppliers. Our team of sewing mamas are all local women with nurslings and school age kids, they work their best each week to make the amazing dolls you see. Why should YOU Purchase these? The quality of these dolls is remarkable. These are not cheap plastic toys manufactured in China with the words “One of a kind” slapped on their packaging…these are true, unique one of a kind hand made heirloom quality dolls. No two will ever be exactly the same…just like people…just like your children. These dolls can handle the busy playtime of any toddler. Running around, dancing, flipping, etc. Your child will be able to play with their doll just like they want to and without you worrying that it's going to fall apart. 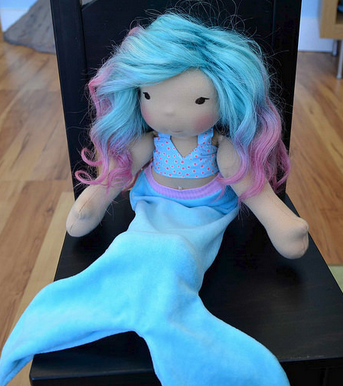 These beautifully created dolls are made to last. When you walk into a toy store or superstore these days you will find many perfect looking factory made plastic toys. Each one is popped out of a machine and assembled by people who cannot even afford to buy the end product or ever even see it. They look great in their cardboard and plastic wrapped boxes and are perfectly symmetrical in every way. Each of these toys are made to break after a specific amount of time so they have to be replaced. Humans are not perfect so why are the toys made to be something the little girls or boys can never be? Dragonfly's Hollow believes that toys should be made with love and care and that they should be suited to the child they will be with. Their toys are made to last a lifetime and are made in a way that they usually can be repaired if they are worn or damaged. All of their toys are made here in the USA by sewing mamas who care about how they are put together. 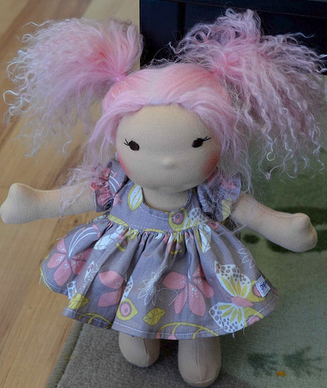 These dolls are handcrafted, natural toys. No worries about lead paint, chemically filled plastic, or parts not screwed on correctly. You're getting a toy that you can feel good purchasing for your child. These dolls are made with wool. And wool is an amazingly versatile natural material. It warms to the touch but never gets sweaty. It takes on the scent of the home, which makes it a wonderful comfort when traveling because it smells like home. It is also naturally anti microbial, mold and bacteria cannot grow on wool. Another plus... It comes with a fabulous warranty! Dragonfly's Hollow absolutely warranty their products for materials and workmanship to the original purchaser for the first two years. After that they will fix the toys for as long as you want to have them fixed if you ship them. Rough play with toys happen, cats happen, older brothers happen, food happens, accidents really do happen. They want these dolls to last for a child’s lifetime and they make them strong to do so. Even if a doll is damaged pretty badly by something they can replace parts of it or the whole doll and make it look very similar to the original. 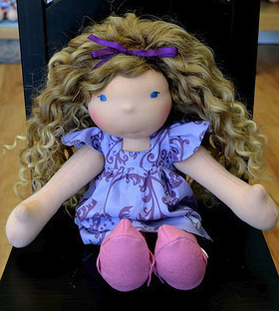 You should purchase a one of a kind doll for the special child in your life. Children’s play time should be imaginative, fun, free of stress. Playing with Natural toys gives kids the opportunity to imagine their best friend is alive and real. These dolls are intended to be loved until they are “real” one day. We invite you to join us in making it possible for your kids to have the type of imagination that we got to grow up with. To order, you can view your options here and contact Lacy through the Starlight Stitches Facebook page.